Christopher Cresacre More (1572 - 1649) was the great-grandson and biographer of the humanist scholar and statesman Sir Thomas More (1478 - 1535).1 Most commonly known by his second name, the youthful Cresacre trained in France for the priesthood at the English college in Douai. However, his ambition to embrace an ecclesiastical career came to a halt in 1599 with the death of his eldest brother John (1577 - 1599). 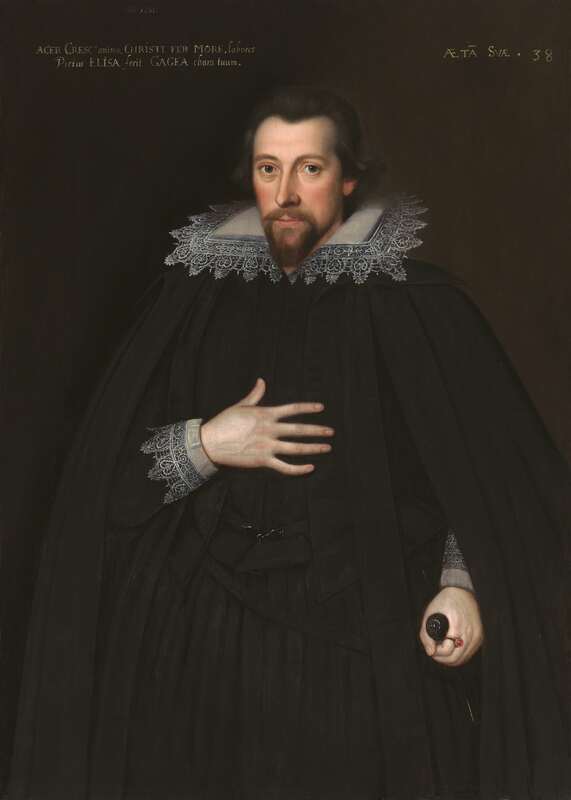 Instead he returned to England in order to assist in the continuation of the family line and, in 1603, he married Elizabeth Gage (1585 - 1610), sister of Sir John Gage, Bart, of Firle, Sussex.2 Upon his marriage, his father settled upon him the ancient family estate of More Hall, a manor situated in North Mimms in Hertfordshire. Like his father, Thomas II (1531 - 1606) who was repeatedly charged with recusancy at quarter sessions, at assizes, and in the archdeacon’s court, Cresacre remained true to his Catholic faith despite the heavy penalties and restrictions he and his family were forced to endure. Sold by the executors of Thomas Peter More, October 1859, Thomas Hollis? Valerie Tunnard-Moore, St. Peter’s Port, Guernsey. In 1630, Cresacre published The life and death of Sir Thomas Moore, Lord High Chancellour of England,3 with a special dedication to the Queen, Henrietta Maria, a leading supporter of the Catholic cause. Despite borrowing extensively from the earlier biographies by Thomas Stapleton (1588) and William Roper (1626), and adopting a more hagiographic tone in his introduction, the book is notable for the tender beauty of Cresacre’s account of the last days of the doomed Sir Thomas. Our portrait, with its deliberately enigmatic inscription, depicts the sombrely attired Cresacre in mourning for his late wife Elizabeth who had passed away the year before, in 1610.4 The painting likely hung in More Hall, where it would have been in proximity to the renowned large group portrait of Sir Thomas More and his family, which he also owned and which now hangs in the National Portrait Gallery, London. Inspired by, and partly copied after Hans Holbein’s lost original, it was painted in 1593 by Rowland Lockey (fl. 1593 - 1616). The painting is a composite representation of five generations of the family, covering a span of about fifty years. Sir Thomas More is instantly recognisable (third from the left), with a beardless young Cresacre (second from the right) aged about twenty-one seen flanked by his parents, Thomas II (1531 - 1607) and Maria Scrope (1534 - 1607). Interestingly, Lockey was also commissioned to paint a miniature copy of the same composition, now in the Victoria & Albert Museum. It was likely painted a few years later, for Cresacre is depicted there with the beginnings of the beard and moustache that we find in our portrait. 1. As Lord Chancellor of England, Thomas had famously objected to Henry VIII’s claim to be Supreme Head of the Church in England, leading to his execution at Tower Hill for High Treason in 1535. Although not formally beatified by Pope Leo XIII until 1886, Thomas was instantly considered a Christian martyr, and soon served as a potent symbol of religious and political resistance and loyalty for the recusant English Catholics, notably for his grandson Thomas II More (1531-1606) and great-grandson Christopher Cresacre. 2. It is recorded that in 1390 the manor was held by a certain John More. Sir Thomas More is said to have written his Utopia there. 3. A facsimile edition was printed in 1971 by Scolar Press, Menston, Yorkshire. 4. A smaller scale bust portrait of Cresacre, likely derivative from this portrait, was formerly with The Weiss Gallery and published in our 2004 catalogue Icons of Splendour (no. 13).